Present state: One platform has been demolished, the other has been partially demolished. The station subway, now bricked up, survives. 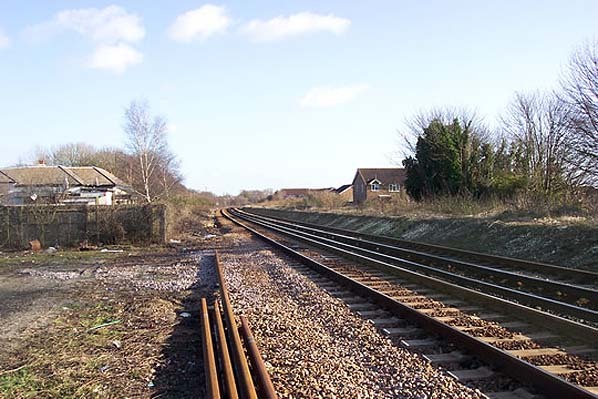 The original Polegate station on the Lewes to St. Leonards line stood immediately east of the High Street level crossing. Prior to the railways, Polegate had been an area of little significance being part of the Parish of Hailsham. The rail connections that followed to Hailsham and Eastbourne caused the town to grow in importance. The initial route from Eastbourne to Hailsham required a reversal at Polegate and to overcome this a new station was built 300 yards to the east in Station Road in 1881. 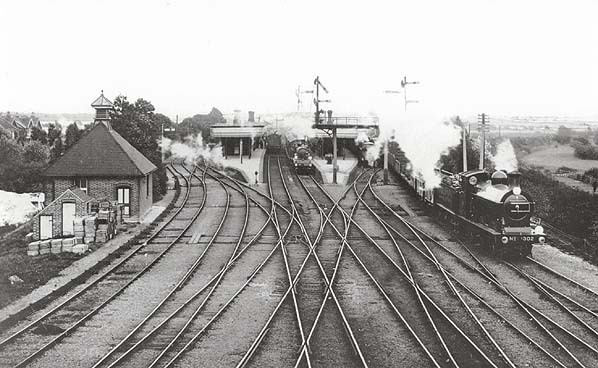 Thus Polegate became an important junction and the number of platforms and sidings were scaled accordingly. 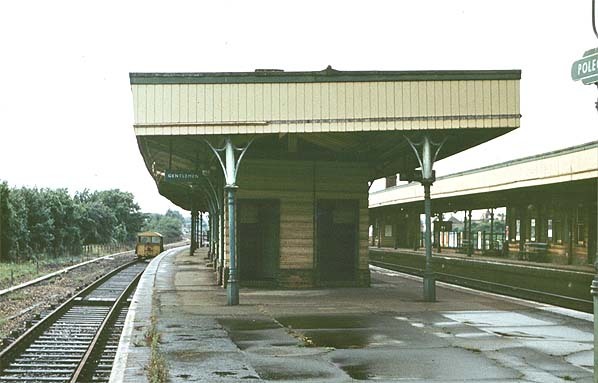 The station was moved back to its original position on 25th May 1986. The 1st station building was still standing until about 1970. 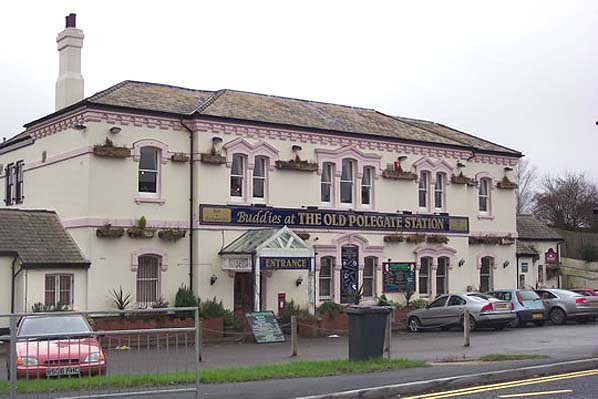 The street level building of the second station survived for many years and was converted into a pub and restaurant known as Old Polegate Station. It ceased trading in May 2016. Initially Polegate Town Council objected to demolition of the building saying it was an important landmark for the town. They were however advised that the building was not in good condition. It was severely damaged by fire in 2012 and has an artificial tile roof and modern extensions. The original brickwork had been painted over and site investigation showed that the original internal features no longer exist. Permission for redevelopment of the site was granted in April 2017 and the building was quickly demolished. It will be replaced by a It will be replaced by a 3½ storey Co-Op store at lower ground level and 22 flats above with associated parking. The remainder of the route northwards from Hailsham to Eridge was completed some 31 years. In 1873, local business interests promoted a Bill for a 3' gauge line from Tunbridge Wells to Polegate. Little progress was made in raising the required capital and the LBSC stepped in, obtaining an Act in 1876 giving them authority to extend their Hailsham line to Eridge where it joined the Uckfield - Groombridge Junction line (opened in 1868). The South Eastern Railway was to be given a share in the receipts and running powers over the line into Eastbourne. Although the line between Groombridge and Tunbridge Wells West was also proposed for closure this remained open but there was no future investment in the line and by the early 1980's the track and signaling needed replacing. 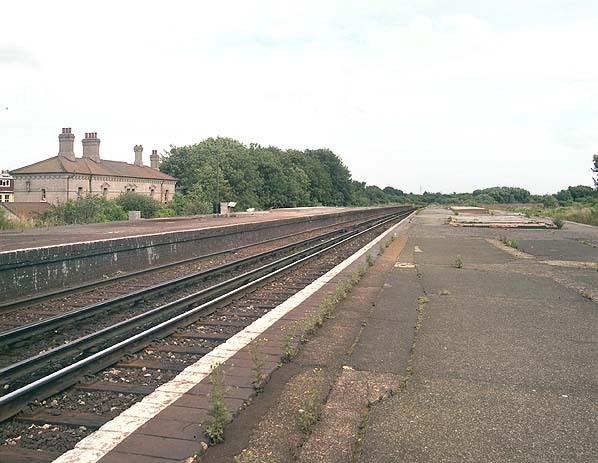 With the planned removal of Grove Junction during the upgrade of the Tonbridge - Hastings line British Rail decided they could no longer justify keeping the line open and announced closure of the line from 16th May 1983. Once again there were strong objections but these were outweighed by British Rail's cost argument. They estimated that to upgrade the infrastructure, while retaining the existing services, would give a £175,000 loss per year and the Secretary of State confirmed closure of the line on 6th July 1985.